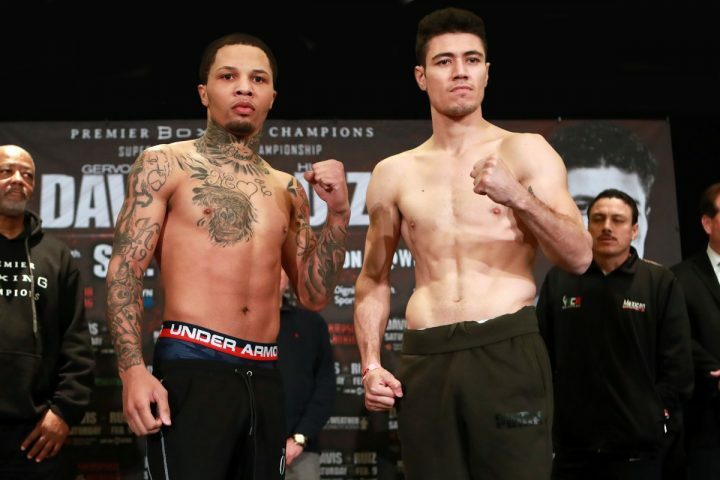 By Mike Smith: Undefeated WBA Super World super featherweight champion Gervonta ‘Tank’ Davis (20-0, 19 KOs) will be in action tonight in facing a stiff test in former WBC super bantamweight belt holder Hugo Ruiz (39-4, 33 KOs) in a fight that promises to be a great scrap LIVE on SHOWTIME Boxing at the Dignity Health Sports Park, in Carson, California. The card starts at 10 pm ET / 7 pm PT. This is going to be a good test for the young 24-year-old Davis to see if he’s as good as some boxing fans, including his promoters at Mayweather Promotions, believe him to be. Gervonta looks like he’s got the goods, but his resume is still too thin for anyone to know if he’s the REAL THING or not. “I feel as though I belong here,” Gervonta Davis said to Fightub. “I’m not being cocky, but I’ve been boxing since I was seven-years-old. I been around Floyd [Mayweather Jr.]. I been around Adrien [Broner]. I been around top guys, that have been at the top level. I believe that it’s my time now. It’s over for me fighting on people’s undercards. It’s time for me to make my own name,” Davis said. On his first attempt to make weight on the scales, Davis came in a little heavy at the weigh-in last Friday at 130.2 lbs. But on his second attempt a little later, Davis nailed it at 129.8 lbs. As long a Davis isn’t weight drained from having to take off extra weight at the weigh-in, he’s going to be usual superb self tonight against the hard hitting Ruiz. These are two lions with massive power that will be tearing into each other tonight. Ruiz is no joke. With his power, he can take the head off of any of the top fighters in the super featherweight division. Ruiz should have been fighting in this weight class a long time ago instead of wasting his time draining down to fight at super bantamweight. Gervonta has been hanging around those guys, but he’s got the talent to be better than Broner. He just needs to start fighting more frequently, and lean on his promoters to put him in with the other champions at 130. Davis was going to fight Abner Mares, but he was hurt in training. Ruiz was substituted. Davis should be fighting better guys like Miguel Berchelt, Alberto Machado, Tevin Farmer and Masayuki Ito. Fights like those are hard to put together because it involves different networks, and it’s not too realistic that Davis is going to be able to get those type of fights until he becomes a huge superstar in boxing. Once that happens, it becomes worthwhile for a fights to be made involving guys from different networks in dual-network fights like we saw in the Floyd Mayweather vs. Manny Pacquiao mega-fight in 2015. Davis is going to be too young, too strong and too fast for the 32-year-old Ruiz tonight. This fight will likely be over within three rounds. Ruiz is a big puncher, but he lacks the chin for him to take the kind of shots that the 24-year-old Davis is going to be hitting him with all night long. Davis made easy of former WBA World featherweight champion Jesus Marcelo Andres Cuellar (28-3, 21 KOs) in knocking him out in the third round last April. No one had ever knocked out Cuellar that fast before. Ruiz’s chin is no better than Cuellar’s. In fact, it might not be even as good as his. If Davis lands his hard power shots early against Ruiz, he’ll score a quick knockout, which is what this writer believes will happen. Ruiz is a good fighter with excellent size at 5’9 1/2″, but he’s someone that is very special in Davis, who might be the best fighter in the 130 and 135 lb weight classes today. Davis showed in his stoppage losses of Jose Pedraza and Francisco Fonseca that he’s on another level from fighters like Vasyl Lomachenko and Tevin Farmer. Lomachenko struggled recently to beat Pedraza by a 12 round unanimous decision, whereas Davis destroyed him in seven rounds. That wasn’t a fluke knockout win for Davis over Pedraza. Davis was putting hands on Pedraza from the opening bell, and beating him up in a one-sided manner. Davis knocked out Fonseca in the 8th round in August 2017. This is the same fighter that Tevin Farmer had to battle hard to defeat by a 12 round unanimous decision in a fight that was a heck of a lot closer than the scores handed down by the three judges last December. The co-feature bout will have one of the most exciting young prospects in the light welterweight division in unbeaten Mario ‘El Azteca’ Barrios (22-0, 14 KOs) facing Richard Zamora (192, 12 KOs) in a 10 round fight. Barrios has excellent size at 5’10 1/2″, and tremendous power. Whether he’s talented enough to beat the best at 140 like Jose Ramirez, Regis Prograis, Josh Taylor, and Ivan Baranchyk, remains to be seen. Barrios still has a long ways to go before he faces those kinds of fighters. Barrios comes into the fight with Zamora with a six-fight knockout streak going for him since 2016. Barrios is getting better with each fight as he matures. It’s scary to imagine how good Barrios is going to be in three years from now. He’s one of those fighters that has blossomed early, and he’s nearly ready to take on the champions at 140. Barrios has the size and the power for him to become a world champion soon. He just needs the opportunity. Barrios has recent wins over Jose Roman, Eudy Bernardo, Naim Nelson, Jose Luis Rodriguez,Yardley Armenta Cruz and Claudio Rosendo Tapia. Zamora isn’t a step up unfortunately from the guys that Barrios has been facing. You can argue that this is a slight step down for Barrios from his fights against Cruz, Roman and Devis Boschiero. Barrios is capable of beating much better opposition than Zamora. Another interesting fight on the card is former WBA super featherweight champion Javier Fortuna (33-2-1, 23 KOs) fighting Sharif Bogere (32-1, 20 KOs) in a 10 round fight, which promises to be action packed from start to finish. Fortuna, 29, has had a couple of career setbacks in losing to Robert Easter Jr. and Jason Sosa. The loss to Easter Jr. was a controversial 12 round split decision last year in January 2018. A lot of people in the boxing world felt that Fortuna did more than enough to get the nod from the judges. He was hitting the taller 5’11” Easter Jr. with beautiful pot shots the entire fight, and it appeared that he was the cleaner, more powerful shots in each round. Two of the judges were more impressed with Easter Jr’s volume punching, most notably his numerous jabs, so they gave him the victory by the scores 114-113 and 115-112. The third judge scored it for Fortuna by the score 114-113. Boxing News 24 felt Fortuna did enough to rate the win. Never the less, Fortuna has the defeat on his record, and he must win his fight tonight against Bogere if he wins to keep moving forward towards a world title shot. Junior middleweights Erickson Lubin and former IBF 154 lb champion Ishe Smith will be facing each other in what could be a fun fight for fans. Also there’s light welterweight Juan Heraldez taking on Eddie Ramirez.